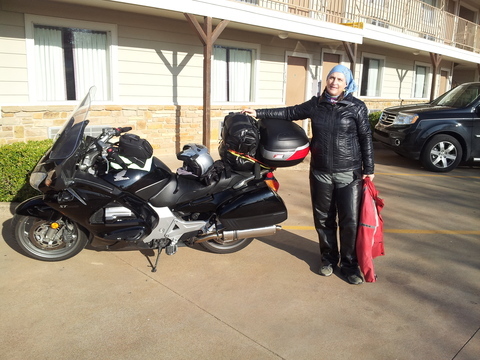 March 28, 2013 — It’s a beautiful day for a motorcycle ride! The Super Shuttle that my sweetheart (SH) had pre-scheduled picked us up at DFW and dropped us off at a Public Storage in Dallas. Our bikes started right up, which we no longer take for granted after our Phoenix to El Paso leg started with a dead battery. We headed to High Five Cycle to get the front tire on SH’s bike replaced. He had researched the cycle shop and ordered the tire ahead of time, so that was a pretty quick service stop. We walked about a half mile to Cheddar’s for lunch while the tire was replaced. This exception to the “no chains” rule qualified because 1) I’ve never been to one before, 2) time and convenience – near enough to walk to and 3) the food was good! I bought a couple t-shirts there, one that commemorates Leslie Porterfield, who holds the world record for woman with the fastest speed on a motorcycle at 253 mph! Two of her motorcycles on which she achieved speed records were on display at the shop. We by-passed the slot machines and went straight for the cafe! We were on State Hwy 75 North by about 1:15 p.m. and survived the freeway traffic and construction until exiting onto Hwy 121 North. The countryside is quite different from the stretch between El Paso and Dallas, and includes a combination of flat farm land and rolling hills, and more trees than I expected. The towns included Honey Grove, Paris, Detroit and little Chicago, perhaps indicating a lot of transplants from those areas? At Bonham we turned onto Hwy 82. We stopped for a break at a gas station in Paris, and based on that 20 minutes and our observations while driving through, it doesn’t come anywhere near living up to its namesake! At Clarksville, we went north on Hwy 37 to the Red River and the Oklahoma border. The river is extremely low, and looks like red desert sand dunes on both sides of the actual water. Near Idabel, OK a second rest stop resulted in a conversation with a trucker who currently hauls products from an area paper mill. He used to haul potatoes from the Red River Valley of ND, so is familiar with our home territory. We also talked bikes – he has a Harley. It was cloudy most of the day, but we soaked up the consistent 70 degree temps with appreciation. It has been a late, cold spring at home, where we finally hit 40 degrees this week for the first time in more than 100 days! I am LOVING the communication systems we bought at the start of this adventure. So much more fun to be able to share our thoughts and interesting points along the way! Broken Bow, OK, is our day’s destination, about 180 miles from our start. Not a whole lot going on in Broken Bow, but the hotel is clean and I’m excited to be visiting Oklahoma for the first time. We took an unintentionally long walk along the highway looking for a steak house that we got a recommendation for, but couldn’t find it. So we walked back and went to the Choctaw Cassino across the street from our hotel where I had a chef salad and SH had a burger at the cassino cafe. I’m also looking forward to what promises to be beautiful scenery and interesting riding roads Friday. Good night from Broken Bow, Oklahoma! Today begins Leg 4 of our 2012-2013 Winter Motorcycle Adventure. And what an adventure it has been! My sweetheart (SH) and i came up with the idea of a segmented winter road trip as a unique way to see the country, an opportunity to extend our biking throughout the year and a really special way of experiencing quintessential Americana together – great memory-making material! SH has done all the itinerary planning, checking in with me for feedback on routes, shipping, storage units, etc. It is such a treat for me to just pack my bag and show up! My job is trip photographer, blogger and finding things to do and places to eat along the way. And of course, being an adventurous, enjoyable travel companion! Here is a recap of our trip so far and a sneak peek at what’s ahead. We started this Winter adventure at the end October 2012, when we shipped our two Honda ST 1300s to Los Angeles via Federal Motorcycle, a division of Allied Van Lines. They strap the bikes on to a pallet and fork-lift them right onto the truck van! After attending Uncles Walter’s 103rd birthday party, we hit the road and biked to Tempe, AZ, over three days. One of many highlights was stopping in Lake Havasu City to have dinner with my cousin Dave, who i had not seen since we were kids. We stored the bikes in a 10×10 storage unit, walked back to our hotel and the next morning rode the hotel shuttle to the airport to return home to Minnesota. In January 2013, we flew to LA to visit Walter for a day, then flew to Phoenix to spend the night at the same hotel. Early the next morning, we walked to storage unit to pick up bikes. We had a slight delay due to a dead battery on SH’s bike, but soon enough were on our way to breakfast with friends who were snowbirding in AZ for the first time this year. We made our way to El Paso, TX, were we enjoyed local sightseeing, including the amazing White Sands National Monument, then stored the bikes and flew home. In February, we combined a visit with Walter in LA with a James Malinchak Mastermind meeting, before flying from LA to El Paso to pick up the bikes and head for Dallas. Highlights of that trip included exploring the Carlsbad Caverns in New Mexico and an overnight visit with a friend in Prosper, TX. And then once again stored the bikes and flew home. I’m on a Sun Country flight to Dallas, as I write this entry. We’ll travel from Dallas to St. Louis on this leg of the journey. The first weekend in May will mark the completion of this amazing adventure. It has already more than met my expectations – SH and I have met wonderful, colorful and gracious people. We’ve experienced small-town America, travelled historic byways, stood in awe of natural wonders, and braved the freeway systems of LA and Dallas. And to think I had never ridden – let alone driven – a motorcycle as recently as four years ago!